As the nights draw in and Christmas approaches here in Scotland bags of unshelled nuts start to appear in my local supermarket, as it is something of a tradition to have a bowl of unshelled nuts around the house at Christmas time. Brazil nuts are a particular favorite of mine as I find the flavour of the unshelled Brazil nuts to be superior in their shelled form even if they can be somewhat challenging to extract. In terms of nutrition Brazil nuts are well known for being very rich in selenium, an important trace element and one that tends to be rather lacking in the diet in Britain due to the low levels of selenium in our soils. While sitting in the evening extracting some of the said nuts from their tough inaccessible shells I found myself wondering exactly how much selenium is there in the Brazil nuts I was eating. The most widely quoted figure is 96 mcg of selenium per Brazil nut and comes from the USDA nutrient database. This is an average value, which I assume is determined from samples of Brazil nuts purchased in the USA. However, mean values such as this can hide a large amount of variation in the case of natural food products. So I thought I would have a look at what other evidence is out there on this subject. After a search of the literature on the subject, I found eight studies in which the selenium content of Brazil nuts were analysed and reported. Most of the papers report the selenium content as parts per million. As this is unlikely to be very informative for the majority of people, including me, I converted the amounts into the number of micrograms (mcg) found in an average Brazil nut weighing 5 grams. I picked 5 grams, as this is the average weight of a Brazil nut as stated in the USDA database. The results of these studied are summarized in the graph below showing the mean selenium content, the origin of the nuts and whether they were shelled or unshelled. What these values show is that there is considerable variation in the selenium content of Brazil nuts analysed in different studies from different places with mean contents varying between 8 mcg and 219 mcg. The table below shows which sample were analysed in each study and where it was reported including the range or values among the Brazil nuts tested. The studies that reported the range of concentrations between individual nuts tested in the study show that the variation between nuts can be even greater than between nuts of different origins. In the most extreme example the selenium in one sample of individual nuts tested by Chang (1995) ranged from 6 mcg to 2560 mcg. Selenium contents of Brazil nuts. * Country the nuts were purchased in. Compared to other tree nuts Brazil nuts are known to be particularly rich in selenium and Brazil nuts contain the highest concentrations of this essential trace mineral of any commonly consumed food. It is mentioned by Pacheco et al (2007) that the Brazil nuts concentrate so much selenium due to the fact that selenium is chemically similar to sulphur, an essential element for the production of the amino acids methionine and cysteine found in the nuts. Sulphur is often deficient in Amazonian soils and the plants incorporate selenium instead of sulphur when the soil contains significant amounts of it. Indeed the majority of the selenium in the Brazil nut is found incorporated into proteins in the form of selenium containing amino acids with selenomethionine being the most common (Kannamkumarath 2002). The concentration of selenium in Brazil nuts has been reported to depend on the selenium concentration of the soil and the ability of the tree to absorb selenium from the soil. This can depend on a variety of factors including the chemical form of selenium in different Amazonian soils, the rain intensity, the genetics of the tree, the forms of selenium containing proteins in the nut and even the position of the nut on the tree (Lisk 1989; Pacheco 2007). There is an interesting difference in the selenium content of Brazil nuts produced in different geographical regions of Brazil and nuts originating from countries to the east of Brazil. From the study results Brazil nuts growing in the Eastern Amazon regions of Brazil appear to contain much higher concentrations of selenium than those growing in the Western Amazon regions including Peru and Bolivia. 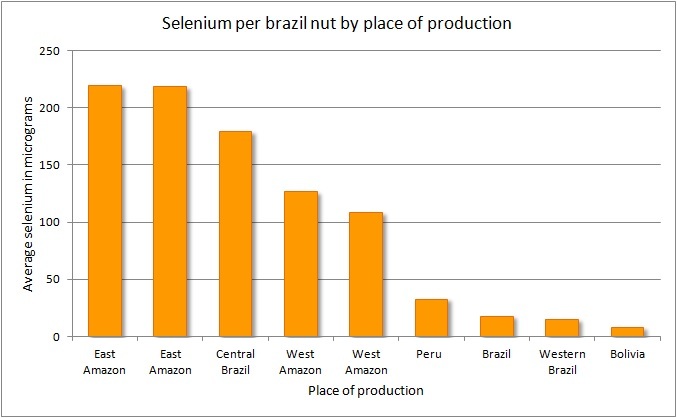 The chart below shows the Brazil nuts with known geographical place on origin arranged by their mean selenium concentrations. It can be seen that as you move from east to west across South America the amount of selenium in the Brazil nuts produced there tends to decrease. It has been reported that soils of the Eastern Amazon region are much richer in selenium than the Western regions (Chang 2005; Pacheco 2007). This may explain the observation that shelled Brazil nuts have often been found to contain considerably less selenium than unshelled nuts. Rather than being due to any effect of the shelling process, it seems that nuts exported unshelled often come from the east of Brazil while shelled nuts often come from the west (Pacheco 2007). However, exported products are prepared by factories using raw nuts from different Amazon sites making it difficult to determine their exact origin. It is interesting to consider how this variability in selenium content relates to the ability of Brazil nuts to act as a good source of dietary selenium. This was investigated by Thomson (2008) in a study carried out in New Zealand, a country with low intakes of selenium. The participants were given 2 Brazil nuts a day or a 100 mcg selenium supplement in the form of selenomethionine. They found that 2 Brazil nuts each day were as effective as the supplement at increasing plasma selenium concentrations and glutathione peroxidase activity during the 12 weeks of the study. This was despite a large amount of variability in the selenium content of the nuts tested in the study. The values listed in the table above for this study are from composite samples as the authors report that they were unable to accurately test individual nuts due to the extreme variation in selenium content, ranging from 0.816 to 1390 mcg/gram. However this extreme variation did not seem to matter as over the duration of the study the intakes appeared to have averaged out to a more reasonable level. While selenium is an essential trace mineral that plays an important role in maintaining good health it also has the potential to be quite toxic if consumed in excess. Recommended intakes for selenium vary by country with the RNI in the UK of 70 and 60 mcg/day for men and women respectively and in the USA the DRI for adults is 55 mcg/day. It can be seen from the table above that in most cases this can easily be fulfilled by one or two Brazil nuts. Selenium is known to be toxic at high intakes although there is some uncertainty as to what this level is. As a precaution the tolerable upper limit for selenium intakes has been set at 400 mcg/day. This could easily be exceeded by a high intake of Brazil nuts particularly if combined with selenium supplements. The data presented here shows that Brazil nuts are on average a very rich and bioavailable dietary source of selenium. The selenium content can be highly variable both between Brazil nuts from geographical regions and also between individual nuts. Due to this Brazil nuts are probably best consumed in moderation. Chang JC, Gutenmann WH, Reid CM and Lisk DJ. (1995) Selenium content of Brazil nuts from two geographic locations in Brazil. Chemosphere. 30(4):801-2. Furr AK, MacDaniels LH, St. John LE, Gutenmann WH, Pakkala IS and Lisk DJ (1979) Elemental composition of tree nuts. Bulletin of Environmental Contamination and Toxicology. 21,392-396. Kannamkumarath SS, Wrobel K, Wrobel K, Vonderheide A, Caruso JA. (2002) HPLC-ICP-MS determination of selenium distribution and speciation in different types of nut. Analytical and Bioanalytical Chemistry. 373(6):454-60. Moodley R, Kindness A, Jonnalagadda SB. (2007) Elemental composition and chemical characteristics of five edible nuts (almond, Brazil, pecan, macadamia and walnut) consumed in Southern Africa. Journal of Environmental Science and Health. 42(5):585-91. Pacheco AM and Scussel VM. (2007) Selenium and aflatoxin levels in raw Brazil nuts from the Amazon basin. Journal of Agricultural and Food Chemistry. 26;55(26):11087-92. Parekha PP. Khana AR. Torresa MA and Kitto ME. (2008) Concentrations of selenium, barium, and radium in Brazil nuts. Journal of Food Composition and Analysis. 21(4):332–335. Secor CL and Lisk DJ. (1989) Variation in the selenium content of individual Brazil nuts. Journal of Food Safety. 9(4):270-281. Thomson CD, Chisholm A, McLachlan SK and Campbell JM. (2008) Brazil nuts: an effective way to improve selenium status. American Journal of Clinical Nutrition. 87(2):379-84. Yang J. (2009) Brazil nuts and associated health benefits: A review. Food Science and Technology. 42(10):1573–1580. This entry was posted in Articles, Food, Nutrition, Research, Uncategorized. Bookmark the permalink. But does it build up in the body and how fast is it eliminated? Without this aspect studied its hard to gauge it’s toxicity. Are there reports of people dying or getting sick from eating too many Brazille nuts? Perhaps the form it’s in prevents this? Let us know your thought? Thanks Glad this article is here ! Thanks Matthew, that was interesting! We know that the Saharan dust blowing across the Atlantic to the Americas gathers much selenium along the way by means of atmospheric accretion. The selenium in Amazonian brazil nuts probably comes from the deposition of this aerosol via rainfall from easterly, marine winds, as opposed to the selenium coming from erosion in the Andean watersheds via alluvial flow. What’s nice about your geographical pattern is that it supports the hypothesis that the Se in brazil nuts originates in the east as opposed to the west. So, your blog-post inadvertently provides evidence of something remarkable: that when we benefit from selenium in brazil nuts we’re actually exploiting a major atmospheric transport system for nutrients, which begins as Saharan dust blown out over the Atlantic, then nourishes the plants and animals of the Amazon, and finally (contained in brazil nuts) gets shipped to markets in the four corners of the world to nourish human bodies. The brazil nut tree potentially benefits as part of this system because Se acts as an additional nutritional reward for the agouti, which disperses and sows the seeds of this species of tree which is indigenous to Amazonia and to this day is hardly cultivated elsewhere. 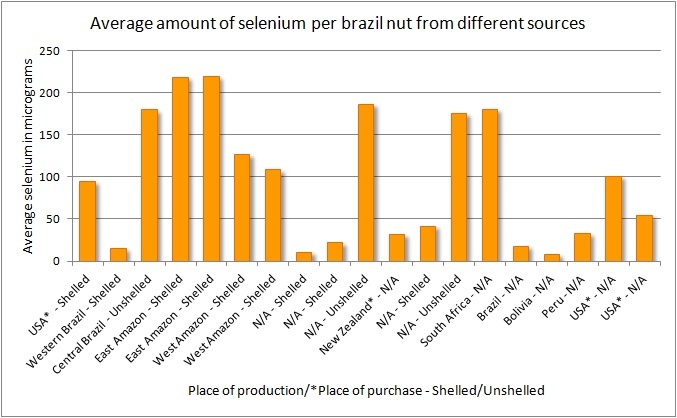 Thank you for this informative summary on the varying selenium levels in Brazil nuts, by source. It is a concise, well-executed summary that goes far beyond what I could have dug up on my own. Thank you so much! Yes, great post on an interesting subject. It also sheds light on the little discussed fact that the nutritional values that most of us just takes for granted, are very uncertain to say the least. Mostly because the basic research is lacking (under-funding? ), but also because of the variation in individual plants due to place of origin, growing condition, season, storage time, preparation technique and so on. I really hope we will get a more “high-definition” image of the nutritional contents of foodstuffs in the future. I find it important and interesting. This is great stuff Matthew and you have gone deeper into it than I have. I am interested in selenium as a trace element sequestered by some viruses (which encode for their own version of GSH peroxidase, which may protect them from WBC ROS but also weakens host immunity). Notably HCV, HIV and ebola have selenocysteine-encoding sequences in their DNA/RNA. Depletion of Se is associated with severity of disease (HIV, HCV, not sure about Ebola). Although B-Se and P-Se surpassed concentrations considered toxic (B-Se: 1000 μg/L (U.S. EPA, 2002)), no dermal or breath signs or symptoms of Se toxicity were associated with the biomarkers of Se status. In the present study population, where Se intake is mostly from traditional diet, there is no evidence of selenosis. Selenosis from supplements, on the other hand, was pretty easy to acquire. Pingback: Madam - Wpływ selenu na organizm, niedobory, nadmiar, suplementacja. I find that some brazil nuts have a metallic taste. Do you know if the Selenium content affects the taste? That might be a way of regulating intake. I have just recently heard that a number of Squirrels die from eating Brazil nuts. I think they were not wild squirrels. I think some people are thinking selenium is more poisonous for squirrels than it is for people. I weigh over 100 times as much as much as full grown Gray Squirrel. This makes me believe that it is not that selenium is less toxic to people than squirrels but that the amount that they get form each nut in relation to their weight is greater. You referred to a SuppVersity post which mentioned Aflatoxin. What are the chances that it was Aflatoxin that killed the squirrels? How fast does Aflatoxin kill? I know that selenium concentrations in plants depend on a number of things. Do you know how much of the variation in the selenium concentrations in brazil nut is from natural variations in the soil and land and how much is from man-made changes? Even the kind of plants that have been growing on a piece of land can change how much selenium is taken up by other plants. How do the past crops planted by farmers effect the selenium uptake of other plants such as nuts of various kinds? Do you know if any countries use selenium based insecticides or selenium for some other purpose in agriculture, especially where nuts are grown. In Food Composition and Nutrition Tables 1989/90 by Souci, Fachmann and Kraut all the other nut listed have way less selenium in them than Brazil nuts do. It seems that ,part of the reason Brazil nut have more minerals than most nut is that they have a large root system, but if the land close to another type of nut tree was high in selenium can other nuts besides Brazil nut be as high in selenium as Brazil nut under the right conditions? In the Food Composition and Nutrition Tables 1989/90 rice was also very high in selenium and wheat also sometimes seems to have a fair amount of selenium in it? When I have tried to find out where the people I have bought nuts from on line get the nuts they sell with one exception I usually cannot get much information. The nuts I have bought on line have been nuts in the sell. I have asked Whole Food were I shop question about the nut growers they use but do not get much information out of them. I think that almonds in the shell are almost always belched, and hazel nut in the shell are sulfated, I am not shore if the law demands this or not. I am not sure if sulfated nuts are bad or not. Do you know anything about this? I do not know what the almonds are bleached with. Do you know is it bad for you?. The one nut grower I found out about considered Squirrels to be the enemy and shots and gassed them. They were meant to be selling organic nuts what would they use to gas squirrels? One nut seller said the growers they buy from treat humans and animals Humanely . I think with animals being treated humanely can include killing them as long as it is not done in a painful way. Can you think of any way to find out where the nuts you buy come from and something in writing from the grower about what their policies and practices are? I do not think there are many if any farmers who do not kill at least some kinds of wild animals so it may be impossible to get nut or other food from farmers and nut grower who do not kill wild animals. Probably a lot of people do not care about the animals, but they still may care about how the food is grown and if it is safe for them. The way it is now it sometimes seems almost impossible to find out were some foods comes from and how it is grown. Today it is sometimes very hard to find the truth about some things. Do you know if nuts grown in Australia can be bought in the U. S. and how I could find out how to buy them? I am going to cheek the box for new comments but I hope I can undo this later if I want later. Can I? Agreed that the shelling process will have no effect on selenium content. Selenium is an element. Unlike a vitamin it does not get destroyed by any process. It might get oxidized, but it is there in the flesh of the nut. It’s not going anywhere. Yes, you can use Brazil nuts to improve selenium status, but why would you want to? They are very expensive. Just take a selenium supplement; top off your selenium intake for a couple pennies per day. Keep in mind that selenium has no normal role in higher plant physiology. Selenium is TOLERATED by plants, and is sometimes (brazil nuts) accumulated by them, but is not required by them. Another way to go: add selenium to garden soil, or add to germinating seeds soak-water; some of it will be taken up; voila: “natural”-source selenium, in case you’re dead-set against pills. AFAIK, the Brazil nuts we get in NZ are grown in China. If you want to supplement I prefer sodium selenite; selenomethionine is not the usual food form (selenocysteine) and seems to have more unwanted effects and lower safety threshold than selenite. Pingback: Got Barium In Your Urine?